This past Saturday was one of the most exhilarating experiences of my garden career! 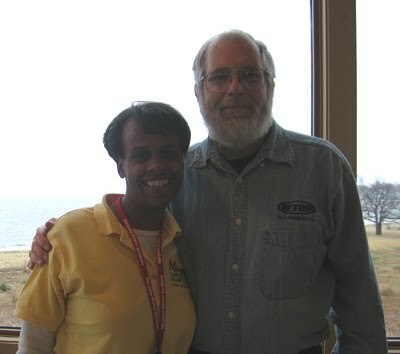 I got to meet Mike McGrath, host of the national public radio show “You Bet Your Garden“. He lectured on the seven secrets to successful organic gardening. But if you are thinking “a lecture…how boring” you haven’t heard him speak. He is full of knowledge and makes you laugh–hard–while imparting his garden wisdom. I was afraid to approach him for a picture, but I did it anyway and he was so very happy to oblige! His lecture confirmed some practices I was already using and gave me some tips for things I also need to add to my repertoire to enhance my organic practices. To sum it all up, use raised beds, feed your soil (I’m talkin‘ compost yaul), invite beneficial insects into your garden, birds are your friends, have something in constant bloom all the time, mulch against weeds, water wisely and (the most important tip) HAVE FUN! Mike has two great books out. One is called You Bet Your Tomatoes and the other is Mike McGrath’s Book of Compost. He autographed both books for me and even said I was “quite a tomato”….awww thanks, Mike, I’m blushing! If you want more nuggets on each of these tips, leave a comment and I will be glad to share! Until next time happy garden thoughts!! You're quite a tomato – cute! Love the photo. Gardeners are the best speakers! Hi, Wendy! Thanks for the compliment. We do make the best speakers, don't we? I think it's our passion for what we do along with the fact that you can always learn something new no matter how long you have been gardening.